Of the wide range of steak cuts, some are more closely associated with grilling than with other cooking methods. 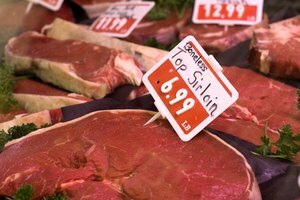 Among the "grilling steaks" are the petite sirloin and top sirloin steaks -- although they sometimes are called by other names, depending on the region in which they are sold. Depending on your needs, one may be better suited than another for your next barbecue or baking needs. You may know petite sirloin steak by its less glamorous names, including flap meat, faux hanger or sirloin tip. This less expensive cut comes from the loin region of the cow, but is closer to the much-used rump muscles, making it flavorful but less tender than other sirloin cuts. At first glance, its rough texture might make it seem difficult to use, but this coarseness provides a good surface for spice rubs and other flavoring agents, including marinades, to hold onto. Petite steak is most often reserved for grilling or broiling. Pan-searing or oven-roasting petite sirloins don't bring enough heat to tenderize the steaks. To grill petite steaks -- their most popular use -- marinade them in oil, Worcestershire sauce and other seasonings for at least one hour. Cook them whole, or cube them for kebabs. After searing whole steaks on the grill for about three minutes per side, transfer them to the cool side until they reach medium-rare, the level at which they taste best. They should be rested three to five minutes before serving. Carved from the center of the sirloin, boneless top sirloin steak is more tender -- and larger -- than petite sirloin steak. This makes it somewhat more expensive than petite sirloin, but rarely as expensive as pricey cuts like T-bone, tenderloin or filet mignon cuts. Top sirloin, sometimes called strip steak or Kansas City strip, is a different cut than what is commonly called sirloin steak, which has a bone and can be more flavorful. 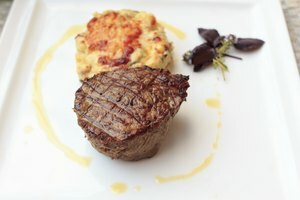 In the U.S., top sirloin steak is sometimes sold as chateaubriand, but be warned that this steak is not the same type as the high-quality tenderloin steak known as chateaubriand in Europe. Like petite sirloin, top sirloin steaks are considered grilling steaks, although they can also be broiled. These steaks don't take well to marinade, so use a dry seasoning method. Ideally, salt both sides of top sirloin steaks the night before grilling, then set them, loosely covered, back in the refrigerator. Grill lightly oiled steaks over medium heat for about eight minutes per side. Rest them for five minutes before serving. 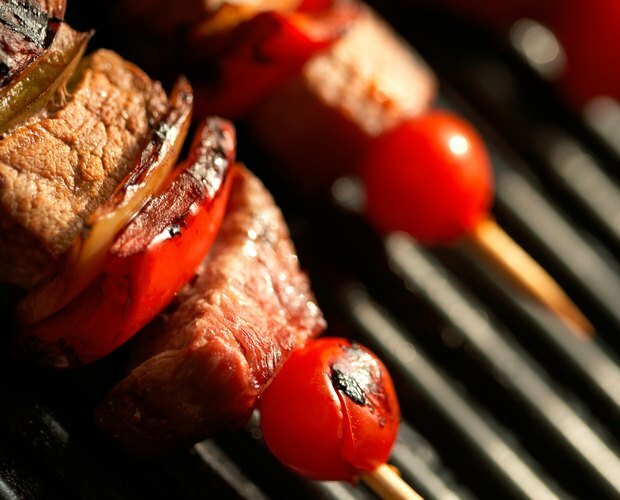 A cooking thermometer can be invaluable when grilling steaks. Petite sirloin and top sirloin steaks are somewhat mushy when rare, but the well-done stage can over-toughen them. 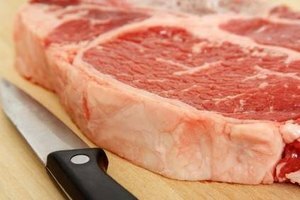 The U.S. Department of Agriculture says fresh beef must reach a minimum internal temperature of 145 degrees Fahrenheit before it can be considered safe. The basic temperature for medium rare is between 130 and 135 F. Use your best judgement about when to remove the steaks, but keep them on the grill until they reach at least 130 F.